The Brown Lady is said to haunt new brides in particular but seems to be quite a harmless apparition. She apparently materialises in one of the bedrooms while the bride is alone and sits smiling at the woman, as if giving her blessing or remembering the first few happy days of her own marriage. She is said to be wearing an ‘old fashioned’ long stiff brown dress. She is never seen for more than a few seconds and is apparently not a scary ghost, in fact some of the haunted women have said it made them feel much more at peace. The building of Doddington Hall began in about 1593 and the Hall was finished in 1600. 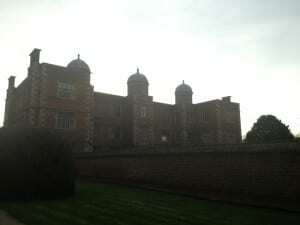 It was built by Robert Smythson who also built Wallaton Hall in Nottingham and Hardwick Hall in Derbyshire. In the mid 1700s the building was inherited by John Delaval who redesigned much of the Hall quite drastically into a more Georgian style although he kept the outside of the Hall the same as it was when it was originally built. The Hall has never been sold for the last 400 years amd today it is the family home of the Birches who inherited the house through the generations, (the family name having changed several times because of women inheriting the building). The Birches devote their work to the upkeep of the house and gardens, preserving as much as possible the original features of the house, as well as encouraging visitors to the house and gardens. At twilight I arrived at the Hall, parked across the road and made my way trepidatiously towards the magninficent building. Although it was out of opening hours, the front gates remained open so I wandered through them to get a closer look. The sun was sinking rapidly behind the building and it’s silhouette looked glorious against the skyline. A sharp movement caught my eye in the nearby garden and I turned around as quickly as possible. A squirrel. The animal ran away from me and into a nearby bush. Whether it was the time of day at which I had come to the building, the quaint surroundings or the homely feel of the place, I found that I was less scared of this haunted building than any other I had visited. In fact I felt quite at peace with the place, as if nothing bad would or could happen there. I wandered down the drive to the back of the building and found more, smaller buildings around here which had evidently been renovated into other family homes. I also found that I could go no further around the back of the place because I was face to face on that side with a high brick wall. Noticing that somebody appeared to be in one of the upper rooms, I plucked up my courage and knocked to try and speak to who I can only assume was one of the house owners. This was to no avail though, I stood for a couple of minutes staring at the old wooden door before beginning the trek back up the long drive towards my own car. Sadly for me, nothing supernatural happened on this journey whatsoever, and even if it had, I find it hard to believe that it would have been at all scary in such a tranquil setting, but perhaps a reader may have a better experience to tell of…?